Looking to create more meaning during the holidays? With the holidays on the horizon, our Philanthropy Services Team shares ways families develop, nurture, and capture traditions – and help build a legacy. 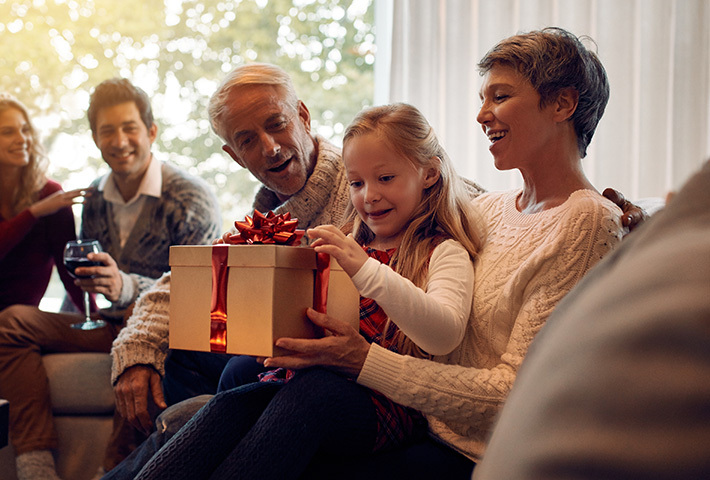 This is that one time of year where we find grandparents, parents, children, grandchildren – and for some lucky families – great-grandchildren all in one place. In our home, we had the tradition of opening the “Surprise Box” on Christmas Eve. It was a very large wrapped box that contained many small wrapped gifts from my grandmother. Each gift was from her home: a glass animal, trinket box, figurine, tea cup, or any promotional product from Reader’s Digest. Grandma would carefully wrap each gift with a note describing the origin of the item. As the years went on, our kids learned how to show excitement over gently used gifts such as Old Maid playing cards and Hummel figurines. I am sure this skill has served them well throughout their young adult lives, but what made this exchange of gifts so special were the stories my grandmother shared about each item. In fact, as the tradition went on, I would tape some of her descriptions on the bottom of the trinkets so that I could remember her stories. These stories became her legacy, and continue to shape our family’s legacy each holiday season as we continue the tradition. Here are a few ideas to inspire your family to capture your family’s legacy. The options below range from easy to slightly more complex, but each have the added benefit of galvanizing your family around common values to support a lasting legacy. Grandparent Keepsake Journal: Found on Amazon, this grandparent's memory journal takes you on a journey that will become a cherished family memoir. For example, it asks the writer to reflect on such topics as: "What was the most difficult choice you ever had to make? Would you make the same choice again?" Telling your grandchild something like that is a personal way to share values and lessons learned, and is so much more enlightening than "What was your mother's favorite recipe?" (Although we like that question too.) The book is divided into 12 months with one question per month. We recommend asking a question or two at the dinner table and transcribing the answers to the book to start the tradition. While the stories are being told, you may video the responses with your cell phone. Imagine generations from now being able to listen to the voices of their ancestors. Exploring Giving: This unique item helps with family conversations around giving and philanthropy, and give each member the opportunity to share values and priorities. It helps jumpstart the conversation, especially with so many topics and differing priorities to address. The Exploring Giving deck lets you choose from among 40 topic cards or use “wild cards” to make up your own. Pick one or more topics to discuss with family members. No matter what the generation, whether a 14-year-old Gen Z or an 84-year-old traditionalist, learn from and about each other’s hopes and values. See more here. Donor Advised Fund: The holidays are also a wonderful time to launch a family philanthropy project, especially when it comes to monetary giving. There are many ways to do this, but one way is to set up a Donor Advised Fund for children/grandchildren. As a financial services firm, we encounter these a lot and know that it might sound self-serving to suggest, but coupling the heart and the wallet is a powerful way to build a legacy. No matter what the amount, this can be a great way to learn what your family cares about most. For example, invite each child/grandchild to choose a charity to support and to share their story with the family about why they chose this charity. How is it making the world better? Why is it needed? If cousins are at the table, a second donation could be made to an agreed upon charity as a collaborative decision involving all of the cousins. This also has the added benefit of a safe training ground to learn about how to come to a consensus as an extended family. So there you go – a few ways to help build a legacy and capture the moments that you are sure to encounter over the next few weeks. For me, it was my grandmother’s uncanny ability to wrap anything in her house and my own children’s ability to get excited about the gift-giving process (as opposed to the gift itself). What will be your family’s legacy? The Philanthropy Services team wishes you and your family a very happy holiday!